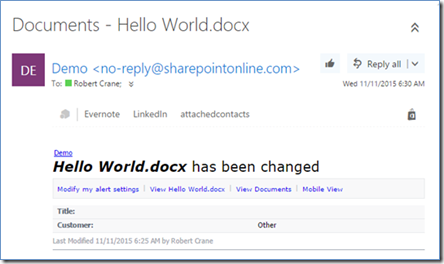 Email alerts allow users to receive a notification in their inbox when something changes in SharePoint. 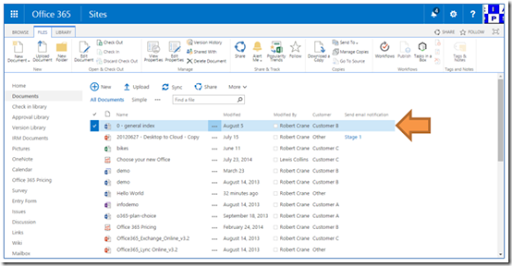 Alerts are available on most SharePoint apps such as calendars, contacts, lists and so on. In this case we’ll look at configuring an email alert on a SharePoint Document Library. The first step is to navigate to the location within SharePoint where you wish to configure the alert. If you then select the Library tab in the top left of the page this should reveal the Ribbon Menu as shown above. You need to locate and select the Alert Me button in the middle of the ribbon in the Share & Track section. This will reveal a drop down menu as shown above. Select the Set alert on this library option to continue. This will open a new dialog like that shown above. You can now customise what the name of this alert will be called using the Alert Title box at the top of the page. Best practice is always to make it as meaningful as possible. The Send Alerts To box should already be populated with the name of the current user. You can add additional names here if you have the appropriate security settings, however it is generally best practices for users to individually configure their own alert settings. If the option is available it may be possible to configure the alert to be sent via SMS, in which case you would need to enter the mobile phone number. However, in most cases you will select the E-Mail option. The email address to the right will automatically be taken from the Office 365 profile of the current user. Depending on the frequency of change that occurs in this location you may wish to not receive alerts for every change that occurs. You can use the Change Type selection to determine what you wil be alerted to. Remember that the default All changes option means you will receive an email alert when anything changes in that location, that is when new items are created and when items are changed and when they are deleted. Best practice is to use SharePoint email alerts only to inform you of the important changes that take place in that SharePoint location. Having the frequency of alerts set too high can result in a significant volume of emails. Best practice is therefore to start with the most infrequent option and increase the frequency as required. You can of course edit and adjust any of these alert settings at any point in the future. The Send Alerts of These Changes option allows you to further customise the frequency of receiving alerts from this area. Again, best practice is always to set the least frequent alert option and adjust if required. The final option allows you to determine when an email will be sent informing you of the changes you selected previously. Electing to be alerted immediately can be very distracting when set on an area in SharePoint that is changing regularly. In most cases best practice is to set the option for a daily summary. When you select either a daily or weekly summary you will be prompted to enter a time when the alert will be delivered. The suggested times for a daly summary are either first thing in the morning or last thing in the evening. Once you have made all the desired configuration changes, scroll down to the bottom of the page and select the OK button to save you changes. You should immediately receive an email notifcation confirming the settings that you have just configured. If you did not receive an email firstly check you junk e-mail folder and then verify the configuration settings via the process above. This email is your confirmation that your alert settings for the area in SharePoint have been set. The email should provide a link to the area in SharePoint that you configure the alert on (here Demo) and a link to where you can change all the alerts you have configured for the SharePoint site. Now when an appropriate change is made to this area you will receive an email advising you of the change as shown above. These notification emails are not sent instantaneously, they are sent by a regular job that runs on the SharePoint server every few minutes so they may take a few moments to appear in your inbox. As noted previous, it is generally best practice to avoid using many emails alerts with SharePoint as the volume of notifications can become overwhelming. 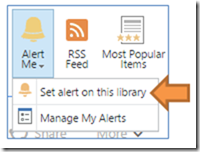 You can return to the Alert Me button at any location and select the Manage My Alerts option. 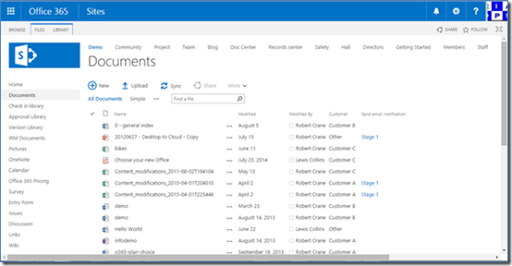 You will then see all the alerts you have configured across yoru SharePoint site. You can select and delete any you wish easily or by simply clicking on the name of the alert you can modify its configuration. Not only can you create an alert on an app inside a SharePoint Team site but you can also create an alert on an single item, in this case a file in a Document Library. In this case you select the individual file in the Document Library and then File tab in the top left of the window to reveal the Ribbon Menu as shown above. In the middle of the ribbon you will again find an Alert Me button you can select. Once selected you will follow through the same process as outlined previously about setting an alert, only in this case the alert will be on a single item in SharePoint.This single item could be an appointment in a calendar, a single line in a list etc.. 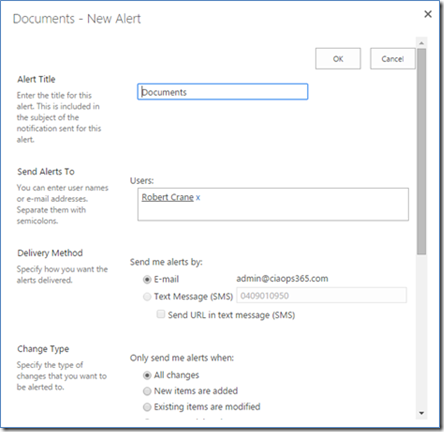 In summary, alerts are set on a per user basis and provide a way to let you know, typically via email, when information in a SharePoint location has changed. You can customise these alerts to provide information about varying levels of change, for example, all changes versus just deletions. You can also customise how often these email alerts are sent, immediately versus a daily summary. The notification you receive in you inbox will provide you information about what has changes as well as links to the locations in SharePoint. Best practice is always to minimise the amount of alerts utilised on a site and their frequency to avoid being overwhelmed with emails. They however, provide an excellent method of being notified when specific SharePoint information changes.